The Sir John Cass Business School (Cass Business School) is part of City University London. The school was established when the Northampton Institute transitioned into City University in 1966. In 2002, it was renamed for Sir John Cass, after his foundation’s generous donation to the program that year. The school has been accredited by several organizations, including the AACSB, AMBA, and EQUIS. Cass Business School has three locations throughout London, as well as one in Dubai. The main London site is found in the heart of the city, close to the University’s main Northampton Campus as well as its residence halls. It is easily accessible to London Tube stations and numerous local attractions. The Cass Development Office is located nearby on Chiswell Street, and the Executive Education program is on Aldersgate Street, just west of the main campus. Transportation to the nearby Heathrow, Gatwick, and Luton airports is conveniently simple through London’s underground and Thameslink train transportation services. The high-tech Cass building in Bunhill Row is home to the Finance, Management and Actuarial Science and Insurance faculties. The location, opened in 2003, also houses the MBA classrooms, the Specialist Master’s Program, the Cass Library, and the Career Resource Center. Also found in Bunhill Row is an auditorium that seats 200 people, along with two dealing rooms designed for hands-on, experiential learning. The events and societies office of the Cass building provide students with networking opportunities within the program as well as with outside professionals. Other conveniences within this building include a student café and restaurant, several computer labs and study areas, and the Cyril Kleinwort Learning Resource Centre–a global financial market research center. The Cass Business School faculty is grouped into three different categories: Finance, Management, and Actuarial Science and Insurance. The Department of Finance at Cass Business School is highly regarded throughout the world. With over 70 members, it is also one of the largest Finance programs. Its London location allows for the courses to reflect the current research findings and market practices, as well as for students to learn directly from the London business community. Areas of study in the department of Finance include: Accounting; Banking and International Finance; Financial Econometrics; Corporate Finance; Asset Pricing and Investment; Risk Management; Real Estate Finance and Investment; and Shipping, Trade, and Finance. The Department of Management’s areas of study include: Corporate Governance, Management, Marketing, Organizational Behavior, Human Resources, Operations and Supply Chain Management in the Charity Sector, Strategy, and Entrepreneurship. The school currently employs over 80 experts in the industry. The Department of Actuarial Science and Insurance comprises 29 staff (including eight qualified actuaries) who often take advantage of the school’s metropolitan location for research and teaching. Areas of research within the program include Health and Care, Life Insurance, Mortality, Non-life Insurance, and Pensions. 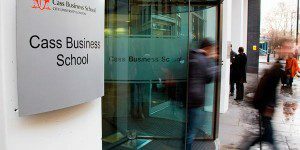 The Cass Business School currently enrolls over 5,800 students, over 3,000 of which are post-graduate. Almost 19,000 students attend City University London itself, with 56 percent of students identifying as female and 44 percent identifying as male. City University London offers a full-time MBA and an Executive MBA in London and Dubai, as well as a Masters in Management.